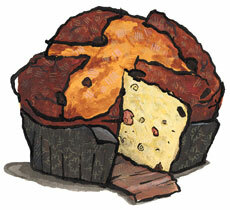 Panettone from Italy for sale. Buy online at Zingerman's Mail Order. Gourmet Gifts. Food Gifts. The feather-light, candied citrus-studded cake that's found in storefront windows and many, many dessert tables across Italy during December. If Italy had to elect a national Christmas dessert, this would be the candidate. The texture is fluffy like a soft pillow, and the dough peels off in long strips like cotton candy. What you can't finish after dinner turns into incredible fodder for French toast. Or serve with some gelato, draped in a thin coat of a dessert wine, like moscato. Wrapped and ribboned, perfect for gifting.